Consists of 16 gauge walls with 5 bays of bracing and swaged, double-bolted connections. The Pinnacle of this Section is Capped with a 14 AWG wall Tube (2.25" OD), protruding 12 inches above the apex of the side rails. This ROHN section is used to top off the 25G tower. The 25AG3 is available in a 9 Foot 3.5 inch section length. This tower uses double bolted joints which are proven to be the best method of joining tower sections for sturdiness and dependability. Featuring a 12-1/2" equilateral triangular design, the 25AG3 is constructed of extra heavy duty 1-1/4" steel tubing side rails with continuous solid steel rod bracing. Each 9'-3.5" section is shipped containing all required nuts and bolts inside one leg. The 25G tower can be used inguyed, self-supporting or bracketed configurations according to specifications in the ROHN catalog. Consult ROHN Catalog Links at Footer Section below for ROHN 25G Tower Details. This Item Ships LTL Freight ONLY. Note: The 2.25 inch Outside Diameter Mast Tube at the Pinnacle of the ROHN 25AG3 Top Cap Section means approx. 2.00 inch Inside Diameter. Antennas with a 2.00 OD Stub will fit, and be secured by 2 Set Screws built onto the Tubing. This is Sturdy stuff for Mounting an Antenna or Dish requiring a 2.00 inch Inside Diameter Pipe Mount. Since there are various other Manufacturers of Towers and Tower accessories that copy the ROHN Tower design, if you are not sure of the manufacturer of your Tower, you can at least compare the actual measurements and design of yours to those found in the spec. sheets in the ROHN catalog section via the Link provided above to assure yourself that additional sections or parts will fit. We cannot make that determination for you as the ROHN clones are something we don't carry or otherwise represent in our Product line. All towers in the GT Series are constructed with high strength steel tubing and feature ROHN's exclusive Zig-Zag ® solid rod bracing to provide exceptional strength. All GT Series Towers are hot dip galvanized after fabrication. In this process, each section of the tower is totally immersed in molten zinc, allowing every square inch of the tower, inside and out, to be completely covered. Hot dip galvanizing protects all points of welding and construction against rust and corrosion while providing an attractive finish. There is a lot of conflicting information out there about the difference between the ROHN 20G and ROHN 25G. The following is factual information based on the invocation and use of the word ROHN, as to delineate the distiction between ROHN and any other Manufacturer or Clone. 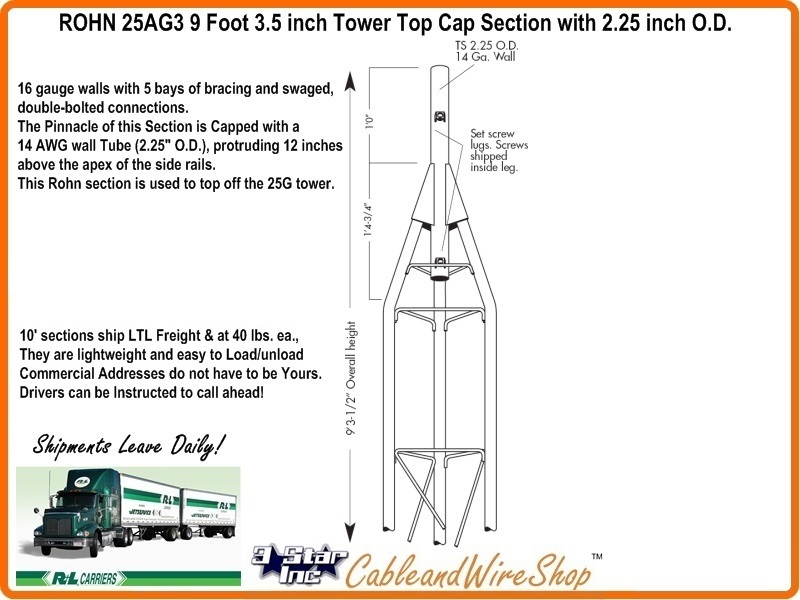 The ROHN 25G 10 Foot main Tower Section weighs approx. 37 lbs., whereas the ROHN 20G 10 Foot main Tower Section weighs 30 lbs. The ROHN 25G Tower Section is 16 gauge steel Tubing, whereas the ROHN 20G Tower Section is 18 gauge steel Tubing. The ROHN 20G 10 Foot main Tower Section consists of 6 bays spaced approximately 18.25 inches while the ROHN 25G 10 Foot main Tower Section consists of 7 bays spaced approximately 15.75 inches. The ROHN 20G Product Line is intended for Home TV Antenna use, to be installed in a Bracketed Configuration, whereas the ROHN 25G Tower line can be Free-standing to certain heights considering antenna and wind load, and guyed up to 190 feet. A ROHN 20G 10 Foot main Tower Section could theorectically fit on top of a ROHN 25G Base or Section, whereas the 25G will not fit on top of any ROHN 20G component. Understand that we sell only ROHN 25G Tower sections and components, we do not sell any 20G parts (not that there's anything wrong with the ROHN 20G Product Line, it's simply that the diversity of our Customer demographics are best served by the ROHN 25G Product Line!). This by no means is an endorsement of "Mix and Match", other than ROHN represents that all ROHN 25G and 20G "Accessories" are the same and completely inter-changeable (emphasis on the word "Accessories"). Most Restrictions Allow for 40 feet of Height without the Necessity of Guy Wires, Anchors or Braces. However, No Tower is self supporting during construction! Always use temporary guys on the top most section, and install permanent guy wires as soon as a guy point height is reached. Wind Loading, Antenna Loading and Wind Survivability ratings vs. Height Documentation Provided by ROHN is available here as a Resource, but is by no means complete by itself or a susbstitution for Engineering Conducted Specific to your Application. Contact Us with any Questions you may have regarding Use prior to Purchase. All Information regarding the ROHN 25G Tower line, Parts and Accessories is as accurate and complete as we can possibly provide given that this Resource Offering is subject to change without Notice and is beyond Our Control.